Well, just as with gain, polar response depends on the frequency ! The gain and polar response/acceptance angle (the latter is taken from the former) will differ for every frequency and the more highly tuned the aerial is the more it will vary according to the frequency. The best example of this are the polar diagrams for the XB14A and XB14 Wideband aerials. The two sets of polar diagrams below are slightly different to each other in that those for the simple aerials (at the top) are roughly proportional to each other in terms of gain, whereas the diagrams below them (for the multi element TV aerials) give the polar response drop off in gain relative to the peak gain for the particular aerial, thus explaining why the XB14WB “high gain” appears to have the same gain as a 10 element type ! 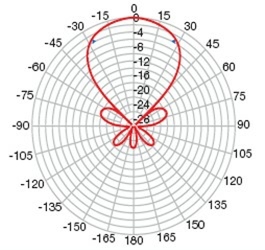 The top polar diagrams are theoretical, the biggest difference in the real world is that, in a reasonable signal area, you would normally get some response off the end of a horizontally polarised dipole due to interaction of the aerial with the pole and/or signal reflections/cross polarisations. 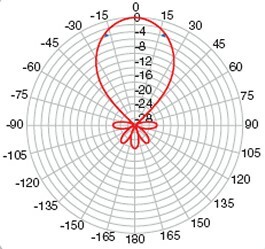 The vertical dipole is drawn as a perfect circle but would lose a small amount of signal is certain directions due to the presence of the pole. 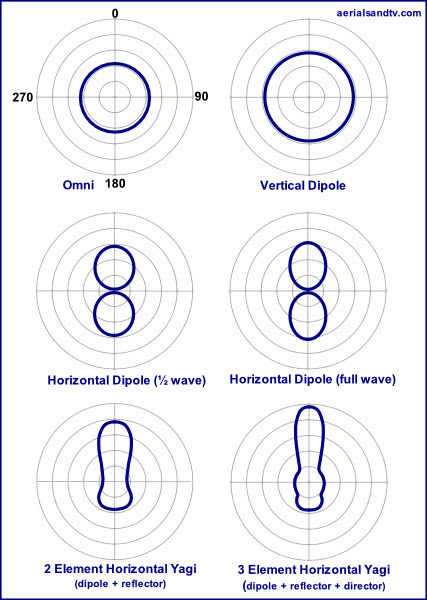 Similarly the Omni is drawn as a perfect circle when in actuality it would not be, also note how the circle is smaller than for the vertical dipole alongside due to the Omni`s negative gain characteristic. Note the lack of side lobes on the Log Periodic aerial. Logs may have a fairly wide acceptance angle (i.e. they`re slightly more likely to receive unwanted signals from just “off line” than a high gain Yagi) but they`re actually less likely to pick up unwanted transmissions from behind than a Yagi type aerial. The tightest beam width, and greatest rejection of signals from behind, would be a phased array. with the vertically polarised aerials (below) . 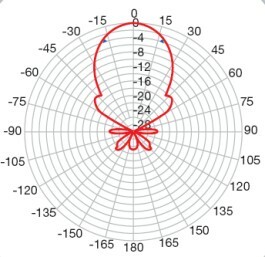 Note how the polar plots for the vertically polarised aerials aren`t as tight as for the same aerial when its horizontally polarised. 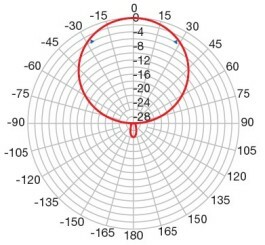 It may well be that the polar diagram for a Contract aerial (and, to be fair, an FM or DAB multi element as well) would have even bigger differences because their reflectors are generally just a single element and therefore have no ”cover” over the dipole to vertically polarised signals from the side, which are more likely to be picked up by the vertical dipole. These diagrams are obviously simplified and representative (e.g. a horizontal dipole probably would still pick up a a bit of signal off its "end"), but they are still worthwhile for showing the basic principles. Thanks to Bill Wright for his advice on the difference in polar diagrams between a half wave and full wave vertical dipole.